Oh hey you guys did you know that the Transformers: Prime season 1 blu ray is released next week? They've scheduled it for March 6th! I'm very excited. even though I've seen season 1 all the way through, I mostly only watched it in Standard Definition, as that is all they offered on Teletoon here in Canada (and yes I already complained to my local cable provider!) I DID get to see some of the episodes in HD thanks to the magic of the Internets and they are mind-blowing! Don't believe me? Check out this clip after the jump! Oh and for any who want to write this off as just another "garbage" TF show, I wouldn't blame you...BUT this one is different. It's got a much more serious and mature plot that the live action movies and better characters too! Has more in common with Beast Wars or the darker Transformers comics than the movies or campy kid-friendly cartoons that we've gotten in the recent past. Plus various members of the cast of Firefly/Serenity are recurring voice actors! Actually ALL the voice acting is great! 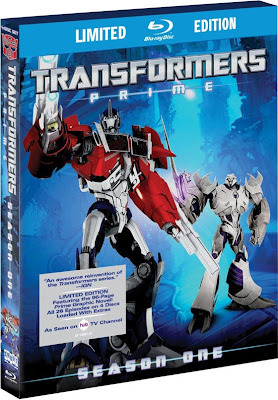 If you can make it through the first 5, sort of slow episodes, this is one of the best Transformers cartoons ever made and the first offered on Blu Ray! Check it out! !